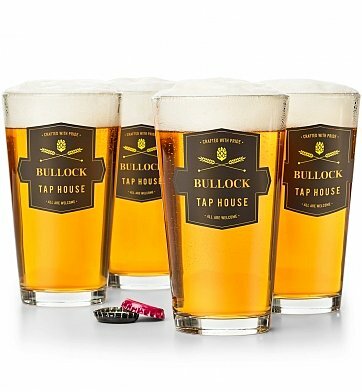 Four (4) Personalized Tap House Pint Glasses. Free Personalization! One line up to 8 characters. Enter information to be engraved during the checkout phase of the ordering process. if ordered by 4:30 pm EDT Wednesday April 24th. Personalized Tap House Pint Glasses is a hand delivered gift. These gifts are delivered by one of our local design centers located throughout the United States and Canada. Same day delivery is available for most gifts when ordered before the cutoff time. The cutoff time for Personalized Tap House Pint Glasses is 2 PM in the recipient's time zone. Made in America by Libbey Glass. Arrives gift wrapped by hand and includes free card with message. Items are securely packaged in a handsome gift box. Xmas gift for son. Received as requested a couple of days before Christmas and put to good use during the holidays. He said it was beautifully packaged, no chance of breakage! The glasses were in perfect condition. Glasses look great, had a shipping error, however, customer service was excellent in helping us search for original lost package and also replace. Our friends loved the personalized glasses! Nephew moved into first appointment & I needed a gift. I'm now the favorite aunt. Nice quality & quick delivery ! The order came as scheduled and looks great. The printing on 3 of the 4 glasses ordered was of poor quality. Thanks to good customer service the problem was quickly rectified. The second set is beautiful and this customer is happy. Ordered these glasses for my Son-In-Law's birthday. They arrived right on time as promised and he was quite happy with them. Score one for Mother-In-Law and GiftTree. Well done, as always. I ordered the personalized pint glasses on Friday and my brother-in-law had his birthday present on Monday! He loved them!! This was such a great purchase and I am very pleased. I bought this as a gift and was very happy with it. Timely delivery, beautifully packed, perfect customization and more than what I expected presentation wise. I can't wait to use GiftTree in the future. Just got these for my husband for father's day. They came packaged so nicely and look even better than in the picture! Personalization looks so good and the glasses are good quality and the overall presentation is excellent.